The AQ6376 has a wide dynamic range and can perform precise, high resolution measurements of the optical spectrum of laser light in the 1.5–3.4 μm wavelength range. 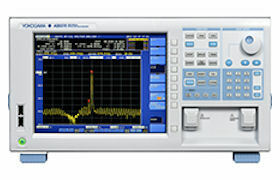 The AQ6376 is a bench-top analyzer that uses dispersive spectroscopy*1 and supports the 3-μm band, an industry first. In recent years, laser absorption spectroscopy*2 has entered wide use in the environmental measurement field for the detection of gases such as carbon oxides (COx), nitrogen oxides (NOx), and hydrocarbon gas (CxHy). Although 2-μm semiconductor lasers have mainly been used as the optical source in such applications, there is an increasing need for 3-μm lasers because these gases absorb more light at longer wavelengths. Optical lasers are also being gradually introduced in the medical field, where the need to analyze substances that contain water is driving demand for 3-μm fiber lasers. Accordingly, there is a growing need for a tool that can precisely measure optical spectra in the 3-μm band. There are already some devices that can measure optical spectra in the 3-μm band, including interferometer-type measuring instruments and large-scale measuring systems that use spectrometers. However, they have disadvantages such as narrow dynamic range and low wavelength resolution that lessen measurement accuracy. 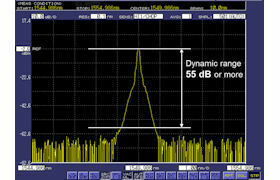 There is thus a strong need for a high-performance optical spectrum analyzer that has none of these limitations.